My childhood memories of Durban are rather like a coastal weather report --- "hazy, but with bright sunny spells; fog-patches may occur". Towards the end of the second Great Depression (1929 to 1932) my parents and sister moved from my father's Zululand sugar farm to Durban. They first settled in Dooneside and I have a picture of them in bathing costumes from that time. I was told that my father had to catch the steam train from Dooneside to Durban and back again every evening. He had started to work at the South African Cane Growers Association in Parry Road. Being born in 1932, I must have caused them many sleepless Dooneside nights. The family subsequently moved to a genteel boarding house called Portcullis on Durban's Berea. Dooneside and Portcullis, however, will remain forever shrouded in deep memory-fog. The first burst of cerebral sunlight occurs on the day we moved to Chelmsford, while I was running excitedly through the long grass of one of the back lawns. The lawns - and all other vegetation - had remained untended for many years. At the age of three, the grass was taller than me and hurt my face. I could write a lot about Chelmsford, among its creaking big trees, but I won't here. My parents loved it because it reminded them of their Zululand farm and my sister and I grew to love it because it was home. Briefly, though, it was an old colonial house with verandahs on three sides, the wooden balcony on the front resembling the ones you can still see in Florida Road (near Gordon Road). To this day, the sound of rain on a tin roof takes me back to the roar of rain on Chelmsford's corrugated iron roofs. The electric light bulbs were distinctly 1930-ish, there were cavernous underground wells to hold rainwater, supplemented by above-ground corrugated circular water tanks, but there was no water-borne sewerage for some years. Neddy the mule arrived to keep the many lawns under control. He left after throwing my sister from the saddle to the ground and stamping on her foot. He was replaced by a wild-eyed gardener who, high on dagga and skokiaan, ran across the lawns all day with the lawn mower. After waving a panga and shouting gibberish, he left too and the family settled for a donkey instead, also named Neddy. Donkey lived in one of the stables. When he was untethered at dusk he cantered round and round the paths surrounding the homestead, trailing his rope, until he was coaxed into his shed. Once, he ate my sister's bedroom curtains. Part of that rope was used to tether a canopy roof outside my bedroom that threatened to fly away during a hurricane; my parents waking up in the night to tie it down. The front verandah looked down the Umgeni valley to the sea. Sometimes the valley was filled with mist, our hilltop floating above it. Occasional early morning mists stole into the garden and it was then that the dappled bushbuck appeared, like ghosts. It was from this verandah that I was to see other ghosts appearing in the dawn light. Convoys of grey ships standing out to sea, not long after war was declared. The front verandah was always an important gathering and viewing point. Often the house was full of farmer friends from Zululand, who arrived in mud-spattered cars (some with tyres still in chains) to stay for a few days. The verandah was the place for drinks, tea, cigarette-smoking and discussion. My grandmother and mother used to work at the Victoria League in Smith Street, preparing and serving sandwiches and tea for the troops that thronged the centre of town. Often they invited a few home for dinner. My father also did. So did my sister once, much to my parents concern, (She was now at Durban Girls College). Father was too old for active service, having traipsed - with the rest of the BSAP - after Colonel von Lettow-Vorbeck and his Schutztruppe in East Africa during the First World War. In WW2, he used to drive the army visitors back to the ship, even during the blackout. At that time, car headlights were concealed behind black metal masks, with only a glimmer of light being permitted through a hooded hole in the middle of each lamp. These night journeys first required him to negotiate unlit Buttery Road, which only joined the comparative safety of Riverside Road after passing between quarry cliffs on either side of the steep roadway. Chelmsford's wooden sash windows were very wide and deep. For the blackout, my father made wooden frames covered by a kind of patterned bison-board, with ventilation slots. On humid summer nights, blackout, with the window covers in place, turned the interior of the house into a Turkish bath. To escape from the heat in the evening, we used to sit in the dark on the front verandah, listening to the croaking of the frogs and crickets, the squeaking of the bats and watching the fireflies. The mosquitoes stung so often on such nights that we all built up a kind of immunity to their bites. Chelmsford mosquitoes had horizontally-striped black and white legs and sounded like Stukas. Some, I swear, were twin-engined. We often moved to the lounge on the other side of the house to listen to the Pilot wireless. This was a large brown box, fluted rather like a midget art deco cinema, concealing a wizard-of-oz assembly of radio valves which glowed in the dark. The speaker was behind a fretwork grill and the dial was a small curved window of celluloid above a large tuning knob. The radio service transmitted from Britain to the French underground was very clear - the call sign being the Morse V sounded on a drum, the dash at a higher pitch than three dots. After a silence came the words "Ici Londre". Radio Zeesen, one of the German propaganda stations was the most powerful. My parents were great friends of a Zululand sugar-farming family. As the farmer's brother was one of the BBC's wartime announcers, we used to listen to his news broadcasts most intently. I never sensed any feeling of apprehension in my parents - no matter how bad the news was. ITMA with Tommy Handley, replaced in time by Much Binding in the Marsh, were also programmes listened to by the whole family. Being shortwave, reception deteriorated into crackles as a storm approached. When it broke, my father and I used to go out onto the verandah to watch the lightning and listen to the thunder crashing over the house. I think it was his way of allaying childhood fears. It was again from this verandah we used to watch the world's noisiest amphibious plane, the pusher-engined Walrus inspecting its flock of ships. Patrolling Sunderland flying boats were a source of particular excitement, as they often flew over the house with a haunted crooning sound. 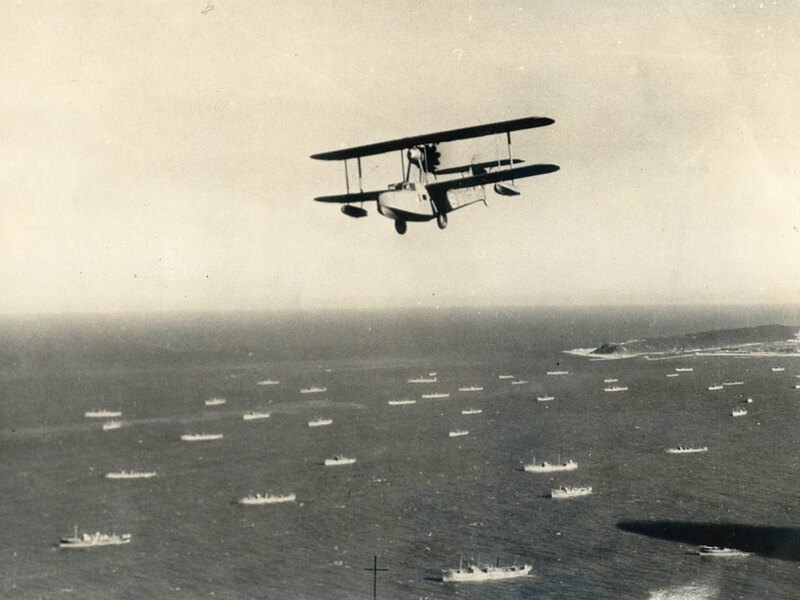 This splendid picture of the anchorage outside Durban was taken sometime in 1942 and clearly one of the Walrus aircraft (referred to above) on patrol. Stamford Hill aerodrome, down Umgeni Road, was to the best of my knowledge, purely military. When the Harvard trainers took off they gave a distinctive high-pitched buzzing while climbing, which gradually turned to a lower contented purr as altitude was approached. In those days the Umgeni tram terminus - really just the end of the line - was at Mr & Mrs Morse's General Store on the town side of the Bridge. Mr Morse was rotund, wore a vaguely clean apron and smoked a smelly curved pipe with a perforated tin lid covering the bowl, attached by a chain. Their store was sweet-smelling and deep, with sacks of sugar, mielie-corn and potatoes. Round blackball sweets, charm sweets and toffees in wrappers were in covered glass jars on the wide wooden counters. Tedder's Chemist was on the other side of the road bridge, at the foot of Mount Argus Road. Mr Tedder, in his small pharmacy smelling of ether and chloroform, was a true old school pharmacist and was always there to attend to sudden health emergencies. I recall a young Indian girl was brought into the chemist's by a frightened mother and father. If you visit the bird sanctuary at Riverside and look up at the top of the quarried cliff you will be looking at the edge of our old property. A very large, flat brown rock marked the cliff edge and inevitably, was called Lovers' Leap by the family. A few steps back from the cliff edge was the summer house which, by that time, had lost all its thatch. This was the viewpoint to watch the Zululand train whistle and clatter over the steel Umgeni train bridge. I was sent on this train sometimes to holiday in Zululand. Steam-power came into its own during the war on the roads, with Coronation Brick & Tile utilising steam-driven trucks. These used to race over the Queen's Bridge, past the Roadhouse, a pre-blackout drinking-hole for troops, and curve away to the brick factory at Redhill. Horses also got a reprieve: Bakers Bread (formerly Bauman's) made its deliveries with vans drawn by giant dray horses. The horses sensed when they were going home at the end of the day, increasing the pace of their trotting. Some kind of coal gas, carried in a large black bag on the roof of cars was also used by motorists to get around petrol-rationing. There was the inevitable scandal when a motorist was discovered cheating - he was using petrol and the black bag was just a front. The tram took us to Adrian Road (incorrectly spelt 'Adrain Road" on the kerb where we alighted), thence to Gordon Road. My sister peeled off to Gordon Road Girls School in earlier days and I to the Prep, just up the road. I don't think the schools expected to survive a direct hit, but they at least went through the motions of building air raid shelters near the playing fields and burying them in earth mounds. War time precautions required us to wear dog-tags with our name and details around our necks and carry a large eraser to grip between our teeth during an air raid. All school windows were coated with muslin to limit flying shards of glass. Thankfully, the raids never came. School was a great place to swop souvenirs. I had an empty aluminium Italian hand-grenade, shrapnel and expired dum-dum bullets. There was also a lively trade in models of Spitfires, Hurricanes and Sunderland flying boats. (My father built me a plywood hanger for my flying boats, complete with camouflaged slipway). For my father to take us for an ocean swim on Sundays in wartime, we had to pick our way through barbed wire at the Country Club Beach. There was a zigzag path through the entanglements that could be closed quickly. Gone is the Indian who, with a small carnation in the palm of his hands, prayed at each corner of the General Post Office. Gone are the flower sellers outside the old railway station. No longer are the pavements of West Street marked with arrows, 'Keep Left' and "Moenie Spoeg Nie" signs. Greenacres disappeared too, long ago. It was a source of child wonder to watch the brass cash payment canisters being sent from all corners of the store on overhead wires, to a central accounting office. Here the cash was collected, change dispensed and the canister returned along the same route. The canisters were propelled along the wires by a counter-hand pulling a lever. This parted vertically twin conveyer wires, causing the canister to 'run downhill' across the store. The system may have been replaced later with a pneumatic tube system, which Cuthbert's shoe shop was already using. After Standard Six I was sent to boarding school in the same year that the war in Europe came to an end. When I came home after four years, the old Durban had gone. © Facts About Durban 2018.